Substitution and Elimination reactions are potentially the most difficult concepts covered at the Organic Chemistry 1 level. 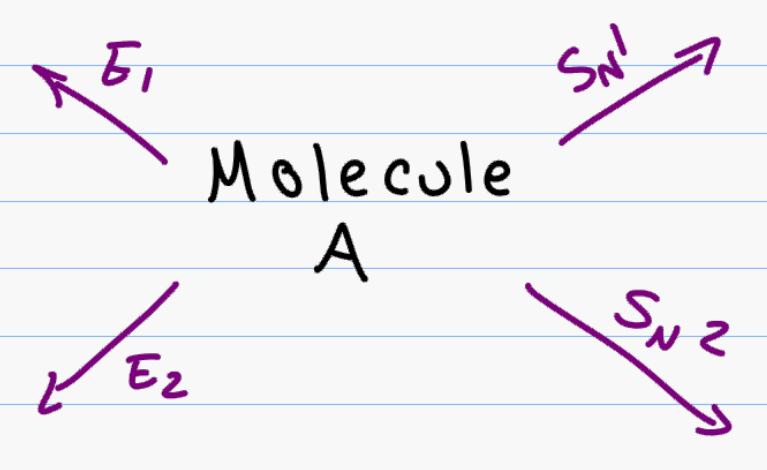 In addition to studying the SN1 SN2 E1 and E2 reaction mechanisms, you also have to understand the similarities and differences so that you can derive the correct products for specific reaction conditions. I’ve put together this medium/tricky quiz to help you practice the reactions and gauge your level of comprehension. Not fully confident yet? Go back and review my entire SN1 SN2 E1 E2 reaction video series and study the associated cheat sheet before getting started. So take your time as you go through the questions. If you get stuck just visit the video series page (linked above) and watch the related tutorial. Download PDF Solutions posted at the end of the quiz. Question 4: Which direction is favored at equilibrium when dissolved in an acetone solution? What about methanol? Predict the product for each of the following reactions. 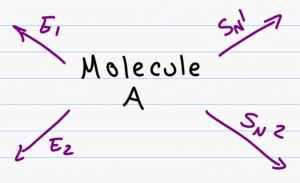 Be sure to show stereochemistry when appropriate. Be sure to label major/minor products when more than one outcome is possible. Question 18 Draw ALL possible starting haloalkanes that would form this product when undergoing unimolecular elimination. Question 20: Predict the product/s when (2R,3S) 3-ethyl-2-iodohexane reacts with NaSCH3 in dimethyl sulfoxide. Question 21: Draw a complete mechanism for the following reaction. Be sure to include all intermediates, formal charges, and pushing arrows. Bonus Question 23: Show the complete mechanism for the following transformation. Hint: More than one reaction is required. What did you think of this quiz? Easy? Hard? Need more practice? hello ! I can’t get the answers via email. Thank you in advance ! Hi Frida, if the solutions don’t come to the email you entered, try looking in the spam folder or maybe try entering in a different email. Ms. Leah, can you please explain number 1? Why is NaSCH3 stronger than NaOCH3? I watched your video again and again, but isn’t the answer different from protic to aprotic? If it is protic, Sulfur should be stronger than O but if aprotic, O is stronger than S? I am so confused…….does that question have to specify that or polar protic is given? Or am I not understanding something? And why is Carboxylic acid weaker than CH3OH? I’m so lost… please help. can someone explain me question 13? Did you check the solutions Yossi? I’m not having the answers,can’t wait to see them…. On question 1, how does NaSCH3 differ from CH3S? NaSCH3 should disassociate to Na+ and -SCH3. How come CH3S isn’t negatively charged? why is question 20 not an E2 reaction? i can’t open the quiz solutions easily, i can’t open the link. idk if i need to pay something or? It’s free. Did you get the email? This quiz was about medium difficulty. I took it once and didn’t understand it. I studied for many hours and now I find it to be a medium difficulty. Thank you Ahmed. did you find it easy or difficult?